Nostradamus Predictions 2017 Speak of Donald Trump and U.S.
Home » 2017 » Nostradamus Predictions 2017 Speak of Donald Trump and U.S. The media shuddered over the results of the 2016 U.S. presidential election. On election night, the bigwigs like Wolf Blitzer and Anderson Cooper at CNN, ABC, and CNBC looked confident, even as Donald Trump took an early lead. It would not be long before smugness gave way to desperation as Hillary Clinton conceded at 2:43 am. Yet Trump’s win was one of Nostradamus’s predictions for 2016. As for “Nostradamus predictions 2017,” even more momentous events are in store. Nostradamus is believed to have predicted global warming and climate change. It so happens that Nostradamus expected these phenomena to strike the world precisely in 2017, according to the interpretation of the rather cryptic quatrains of his book Les Propheties (The Prophecies), written in 1555. Interpreters of Michel de Nostredame, aka “Nostradamus,” who lived in France in 1503 and was an astrologer, writer, pharmacist, and chemist, have identified 2017 as a crucial year for an escalation of wars due to global warming, a resulting depletion of resources, and an increase of disease. Inevitably, this means the end of America as we know it. Modern-day interpreters say there were many Nostradamus predictions about United States. First, it should be noted that the visionary was aware of America existing, having been born a full decade after Christopher Columbus discovered it in 1492. Nostradamus is said to have predicted the rise of Adolf Hitler and the death of King Henry II. Regarding “Nostradamus predictions about United States,” the visionary would have predicted the assassinations of John F. Kennedy and Robert Kennedy, as well as the lunar landing. Those who study the Nostradamus predictions list believe that he predicted Trump’s election. The combined references to “trumpet,” “shameless,” “bold,” “madness,” and “Byzantium” are fascinating. “Byzantium” means Turkey or the Middle East, which so many migrants have been using as a platform to reach Europe. “Trumpet” stands for Donald Trump. This is a suggestion that Trump will engage in some kind of military operation involving the Middle East. Nostradamus notwithstanding, Trump has already ordered an over-three-percent increase to the military budget. Senators like John McCain suggest this doesn’t go far enough, and Congress may approve an even bigger military budget. There seems to be little doubt of Nostradamus future predictions of World War 3. One of Nostradamus’s predictions mentions the devastation of present-day Syria and Iraq by a man whose description reminds one of Abu Bakr al-Baghdadi, the leader of ISIS. The name is not mentioned, but the similarity between Nostradamus’s pirate and “Caliph” is uncanny. The 16th-century visionary speaks of a villain who will terrorize Mesopotamia, which is present-day Syria and Iraq. The villain (ISIS) will be the final Antichrist that will provoke a third world war that will last 27 years. The two previous Antichrists were, in some interpretations of Nostradamus, Napoleon Bonaparte, and Hitler. World War 3 predictions aren’t the sole preserve of Nostradamus, of course. There are signs of the new militarism everywhere. The expected Russian-American thaw in relations has not happened. In fact, Vladimir Putin’s Russia has responded to Trump’s provocations by boosting military spending of its own. Nostradamus predicted that a war between these two world powers would start under the “great trumpet,” i.e. Trump, and that it would last 27 years. That’s not all. Even as nuclear wars are waged, natural disasters will add their own calamities as they strike our planet. Just as in the 2011 movie Melancholia by Lars Von trier, a giant planet shall approach the Earth. Some have suggested that planet will be Nibiru, aka Planet X, which could even take the form of a Star Wars-like “Death Star.” That is, an artificial secret weapon that the National Aeronautics and Space Administration (NASA) or the U.S. Air Force might be developing. The next Nostradamus prediction to match the threat from outer space comes from the bottom of the Earth. This next Nostradamus prediction is about the great eruption of Mount Vesuvius. If Trump policies and his military spending don’t do it first, the eruption of Vesuvius would certainly prompt European and U.S. economic collapse. Vesuvius, of course, is the volcano in the Gulf of Naples that destroyed the city of Pompeii in 70 AD. It erupted on a few other occasions, the last one being 1944. Coincidentally, it happened during World War 2. Since then, other than the occasional puff of smoke, the volcano has been rather peaceful. Nostradamus or not, geologists expect another eruption as a matter of when rather than if. A major eruption would wipe out millions of people who live in one of the densest metropolitan areas in the world. The numbers of dead would number in the millions, as would the refugees. This would fuel an economic crisis in Italy, a key member of the European Union (EU) and the eurozone. That kind of devastation threatens economic growth in Europe, and therefore, the rest of the world, including the United States. 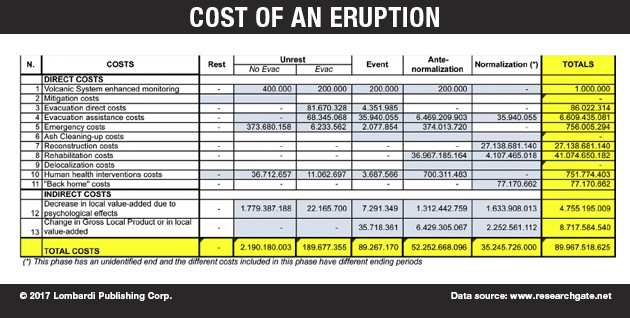 As the chart below suggests, even an average eruption can cost up to $90.0 billion. Imagine a cataclysmic eruption for the ages. The cost would be in the trillions of dollars. Volcanic eruptions have killed entire civilizations. In the 15th century or so, a volcano erupted on the Greek island of Thera, which you might know today as Santorini. The island was split in two, burying a city below the rubble. Now the Greeks call that city Akrotiri. Experts who have analyzed Nostradamus’s writings say that the visionary apothecary expected these catastrophic events in 2017. Interestingly, one of these coincides with the Prophecy of the Popes, thought to have been written by Saint Malachy some 450 years before Nostradamus. Nostradamus and Saint Malachy, writing at different times, seem to agree that the 112th pope would be the last. The 112th pope happens to be Pope Francis I, the current one. In other words, Nostradamus expects the world to meet an apocalyptic demise in, or shortly after, 2017. Hard as it might be to believe, Nostradamus and Saint Malachy were clear. The former said that the final pope would be the last one to be elected before doomsday. The last pope, wrote Nostradamus, would flee Rome when “two suns” would appear in the sky. The comet ISON fits the bill. It was first discovered in 2012, but became more visible in February 2013. As for Saint Malachy, he expected Pope Francis to be the last pope on the list. The end would be brought on by a number of calamities, which would strike the earth in 2017. Some of these are World War 3 predictions, and they stem directly from Trump policies, given Nostradamus’s prediction of Donald Trump himself. Whether you trust Nostradamus, 460 years ago he predicted that the world would see a major turning point in 2016 and 2017. Even those who have never heard of Nostradamus agree that we have reached a key moment in world history, and that the risks of World War 3 and economic collapse are all too real and present; no prophecies required.